LA JOLLA–(February 12, 2019) What makes us human, and where does this mysterious property of “humanness” come from? Humans are genetically similar to chimpanzees and bonobos, yet there exist obvious behavioral and cognitive differences. Now, researchers from the Salk Institute, in collaboration with researchers from the anthropology department at UC San Diego, have developed a strategy to more easily study the early development of human neurons compared with the neurons of nonhuman primates. The study, which appeared in eLife on February 7, 2019, offers scientists a novel tool for fundamental brain research. “This study provides insights into the developmental organization of the brain and lays the groundwork for further comparative analyses between humans and nonhuman primates,” says one of the senior authors of the study, Salk President and Professor Rusty Gage, who holds the Vi and John Adler Chair for Research on Age-Related Neurodegenerative Disease. Two important processes in brain development include neuron maturation and migration. Maturation involves neuron growth as the neurons increase their connections between each other for better communication. Migration is the physical movement of neurons into different parts of the developing brain. The authors sought to compare neuron maturation and migration between humans and nonhuman primates. 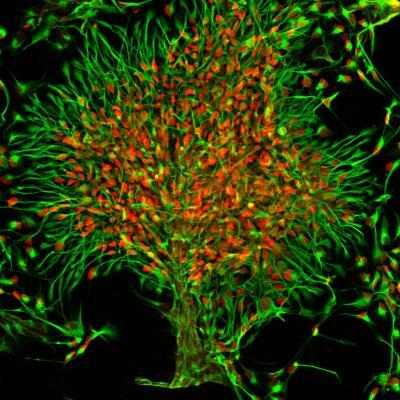 To accomplish this task, the Gage lab devised a new method utilizing stem cell technology to take skin cells from primates and coax them, via a virus and chemical cocktails, to develop into neural progenitor cells, a cell type that has the ability to become multiple types of cells in the brain, including neurons. These new primate cell lines can then be perpetually propagated, allowing researchers new avenues to study aspects of neuronal development of live neurons without tissue samples from endangered primates such as chimpanzees and bonobos. The researchers first explored the differences in gene expression related to neuronal movement, comparing human, chimpanzee and bonobo cells. They also investigated the migration properties of the neurons inherent to each species. They found 52 genes related to migration, and, interestingly, chimpanzee and bonobo neurons had periods of rapid migration, while human neurons were slow to move. In order to compare neuron movement and maturation outside of a dish, the scientists transplanted the neural progenitor cells from both humans and chimpanzees into the brains of rodents, enabling the neurons to thrive and providing additional developmental cues for the neurons to develop. The researchers then analyzed the differences in migration distance, shape and size of the neurons for up to 19 weeks after transplantation. They observed the length, density and quantity of extensions of the neurons called dendrites, as well as the size of the cell bodies, which house the nucleus and DNA. The chimpanzee neurons migrated a greater distance and covered a 76 percent greater area than the human neurons after two weeks. Human neurons were slower to develop but reached longer lengths than the chimpanzee neurons. This slower growth pattern may allow humans to reach more developmental milestones than nonhuman primates, which could account for differences in behavior and cognitive abilities. In the future, the authors hope to construct an evolutionary tree of multiple primate species, utilizing induced pluripotent stem cell lines, to better understand of the evolution of the human brain. In addition, the authors plan to use this platform to study gene regulation differences between primate species that underlie the differences in neuronal maturation and can potentially impact brain organization in humans. Other researchers on the study were Krishna Vadodaria, Sara B. Linker, Inigo Narvaiza, Renata Santos, Ahmet M. Denli, Ana P.D. Mendes, Ruth Oefner, Jonathan Cook, Lauren McHenry, Jaeson M Grasmick, Kelly Heard, Callie Fredlender, Lynne Randolph-Moore, Rijul Kshirsagar, Rea Xenitopoulos, Grace Chou and Nasun Hah from the Salk Institute for Biological Studies; Branka Hrvoj-Mihic, Katerina Semendeferi and Alysson R. Muotri from the University of California San Diego; Bilal E. Kerman from at Istanbul Medipol University; Diana X. Yu from the University of Utah; and Krishnan Padmanabhan from the University of Rochester. The work and the researchers involved were supported by grants from the National Institutes of Health, the Leona M. and Harry B. Helmsley Charitable Trust, the California Institute for Regenerative Medicine and the Brain and Behavior Research Foundation (formerly the National Alliance for Research on Schizophrenia and Depression).